Rotating mannequin in short shorts. Light denim shorts for women. Clothing of high-quality fabric. Imported clothes on sale. 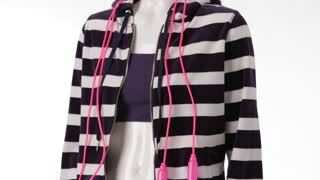 Mannequin in striped hoodie turning. Mannequin with pink skipping rope. Striped hoodie over short top. Sale of sports clothing. Mannequin in lace shorts turning. Lady's white lace shorts. Shorts of delicate fabric. Popular merchandise from clothes catalog. Mannequin in denim jacket turning. Short denim jacket over dress. Lady' classy jacket on sale. Trendy clothing for young girls. Yellow dress with light accessories. Casual yellow dress on shelf. Lady's aviator sunglasses with purse. High-quality clothing on sale. Aviator sunglasses and pink garment. Woman's pink garment on shelf. Small metal elements on clothing. Bright fabric of high quality. Denim handbag and blue top. White footwear and floral pants. Wooden showcase with clothing items. End of season sale.